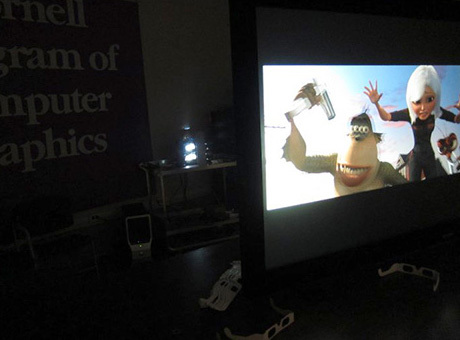 For Phil “Captain 3-D” McNally (DreamWorks) visit to Cornell we decided to converted Cornell Cinema to a 3D Movie Theater, so that we can show stereo content in 3D. We had to act fast with less than two week preparation time. The first decision we had to made was what kind of technology will we use to channel the images to the appropriate eye. Anaglyph would have been easy (only one projector is needed), but it was important to us to show the correct colors. We could not use shutter glasses either, because it would have been too expensive to buy glasses for an expected crowd of 250. 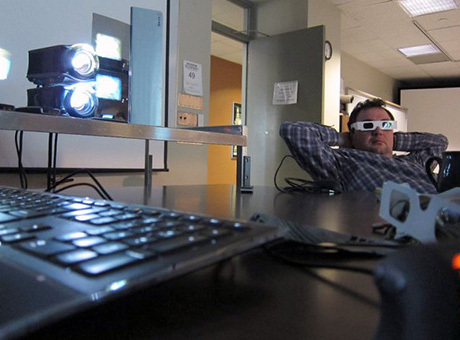 So, we decided to use two projectors with one polarizing filter each and polarized 3D glasses. Because of cost and ghosting issues we also decided to use linear polarizers and not circular polarizers. 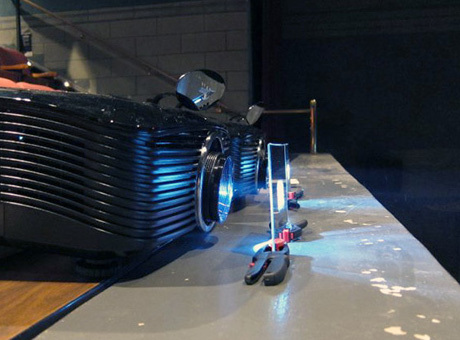 Finding good projectors for a movie theater can be challenging. 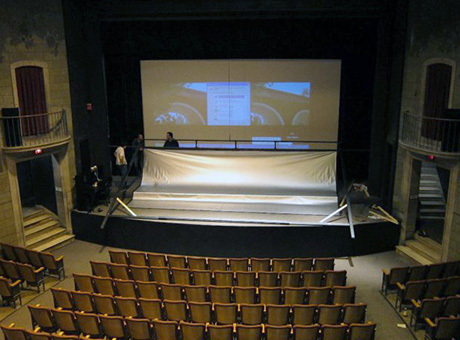 The screen is bigger than the screen in most lecture halls, which means we needed bright projectors. 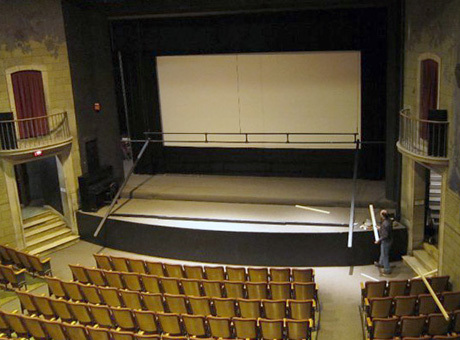 The screen dimensions and the content required wide screen projectors. 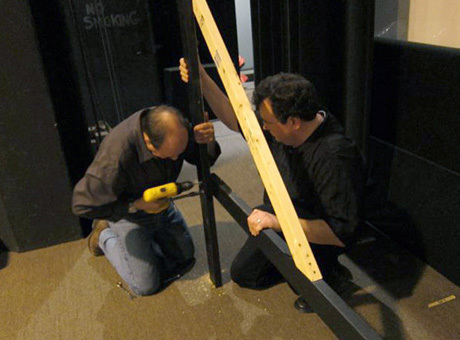 Additionally the screen size to distance ratio is pretty small, so we needed long throw lenses. 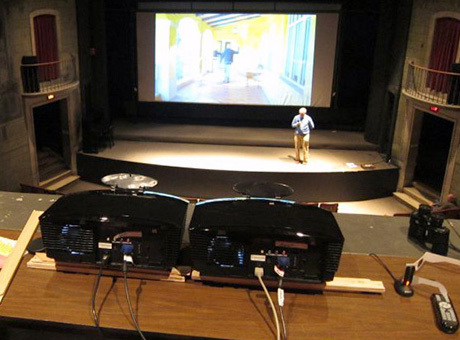 After some research we decided to use Optoma HD8600 and Optoma was so generous to provide us with two loaner units. 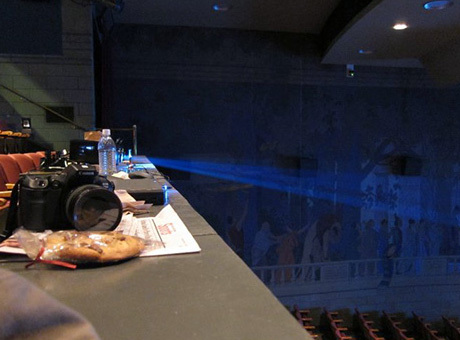 These projectors are pretty powerful, so we had to use glass filters (the projector would have melted plastic filter).